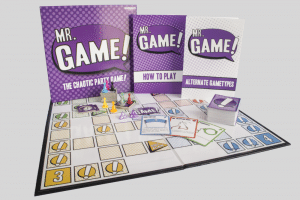 Mr. Game looks, at first glance, to be a simple roll and move game that would have found its way to our gaming tables ten to fifteen years ago. 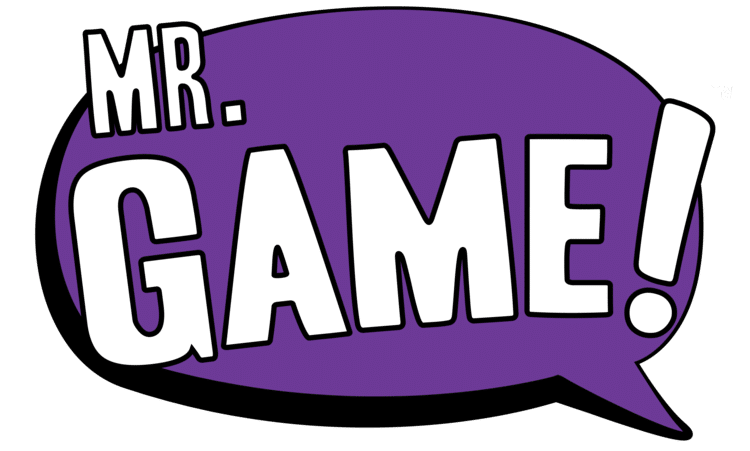 The truth is that Mr. Game turns that formula on its head. Its actually a party game that encourages players to bend the ambiguously written rules to their limits to eek out a victory. The game is played simply enough. The objective is to move one of your pawns to the goal. To do this, players take turns rolling the pair of four-sided dice and then moving one of their two pawns the appropriate number of spaces. Landing on a space with an exclamation point earns you a Mr. Game card which could be a Badge that will either hinder you or help you or an action card that will let you impact the game in other ways. Super boring and run of the mill right? Well… yeah… if you play it straight-up. The key is that Mr. Game doesn’t want to be played that way. Each time you play the game you are instructed to designate one person at the table to be “Mr. Game.” Their job is to, essentially, be the game. The rulebook is incredibly short and leaves a lot of decisions and situations ambiguous. The intention is for players to challenge those rules and try to question the different ambiguities in order to give themselves an advantage. This is a game that rewards people who enjoy trying to find rules loopholes while they play. The party doesn’t really start with Mr. Game until people start trying to argue the rules to their advantage on each and every turn. We have played a lot of this game since we got our copy and we enjoyed our time with it. One of the things that we enjoyed most is that it scales based on the interests and enthusiasm of the players. We have had a group of younger kids play it as a straight roll and move game and they enjoyed its simplicity. We have also had a group of experienced gamers go at it for a half hour over whether being able to place a tile anywhere on the board means that you could put it on its side and block another players progress. If I were to point out any real weakness in Mr. Game it would be that the game’s real charm goes missing in mixed company. Younger kids often have difficulty competing with older, more experienced gamers which can rob the game of its fun. This is also a game that becomes more rewarding at high player counts. Two players won’t really get much out of it at all. I would recommend treating this one like a pure party game. If you, or anyone in your regular playgroup, absolutely loves arguing about rules just for the fun of it then this will be a worthy addition to your collection. Thank you for making it sir! It was our pleasure!